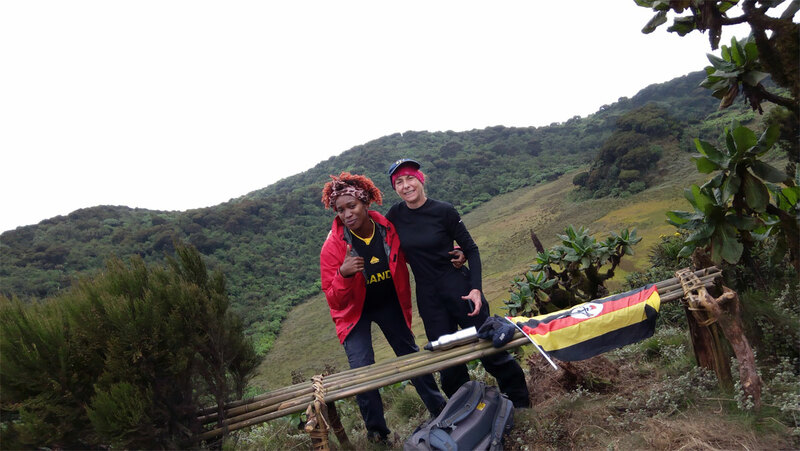 I had never heard of Mount Gahinga prior to Matt Battani, the secretary of the Mountain Club of Uganda, who mentioned it to me. He recommended it as a less technical 6-8 hour day hike that could easily be fitted in over a weekend. This sparked so much excitement inside me as it meant I could head out to Kisoro, very close to the Rwanda-Uganda border, on a Friday afternoon after work, hike on Saturday and then return to Kampala on Sunday.At first I thought about hiking Mount Gahinga on my own, hiring one or two UWA guides for protection and guidance, but I later thought involving other friends and club members would make it even more interesting. So, on Friday the 18th of August, 5 of us were seated comfortably in a super custom van we had hired, 2 lovely American ladies named Pam and Kate, 2 amazing brothers Andrew and Richard that took the initiative to drive, and myself. 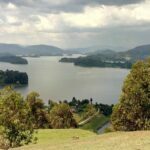 Our Journey towards Kisoro commenced at around 3pm on that Friday afternoon amidst the chaotic Kampala traffic jam where vehicles on the road were either stationary of moving very slowly. It was such a relief to finally get out of Kampala by 5pm and to enjoy a more relaxing drive towards Kisoro. Pam and Kate had carried along enough food to feed all of us (a very kind gesture that I still appreciate). We had chicken, salami, cheese, bread, chapatis and Crisps. Andrew brought along some Juice and alcohol one could easily think we were headed out for a feast rather than a hike. 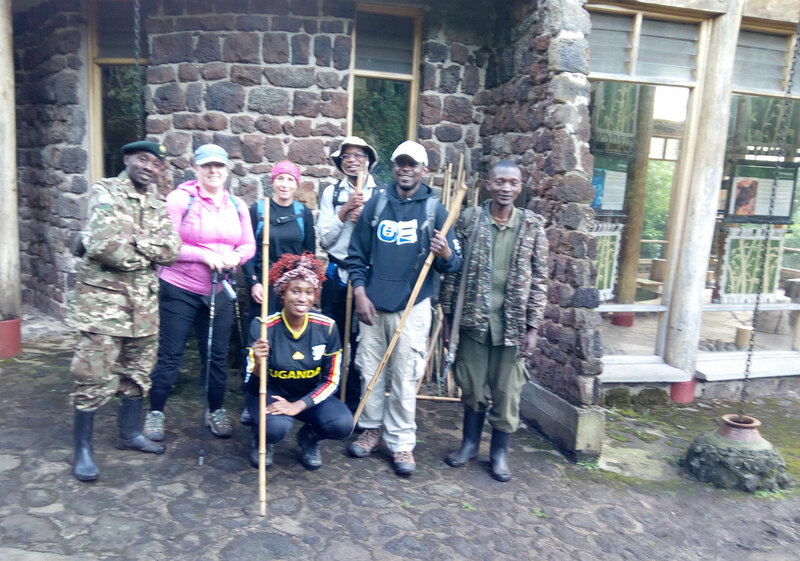 The journey took us a lengthy ten hours prompting us to fall asleep in the vehicle, we got to Kisoro town at about 2.30am, rung our UWA guide Zachariah (a lovely gentleman who was recommended to us by Matt). He was kind enough to ride his bike in the cold as he guided us towards the park entrance. Andrew and I were struggling to set up the tent and catch some sleep. Pam and Kate were luckier as they opted to sleep at the Cabin lodges. 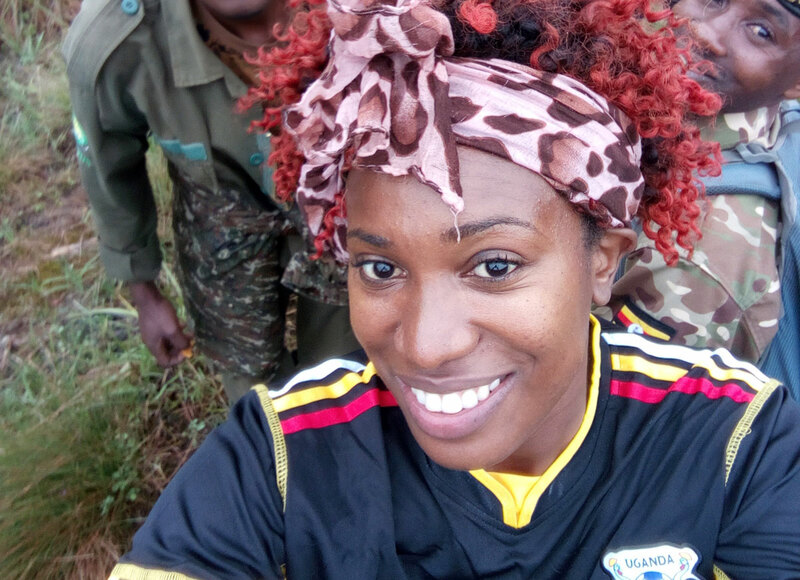 I usually prefer camping and sleeping in tents but the idea of setting up a massive tent at 3am in the brutal cold in Kisoro was not such an appealing idea. Richard opted to sleep in the car, but helped us pitch our tent and we all went to sleep. I felt my head had hardly touched the pillow and it was suddenly 7am and we were up. I headed out to the communal bathroom to have a shower, an act I greatly regretted in all the ten minutes I was in there! The water was extremely cold that I almost thought I would die from hypothermia while showering. However, after dressing I was glad I had the shower as it played a great role in waking me up and getting me both mentally and physically prepared for the hike. 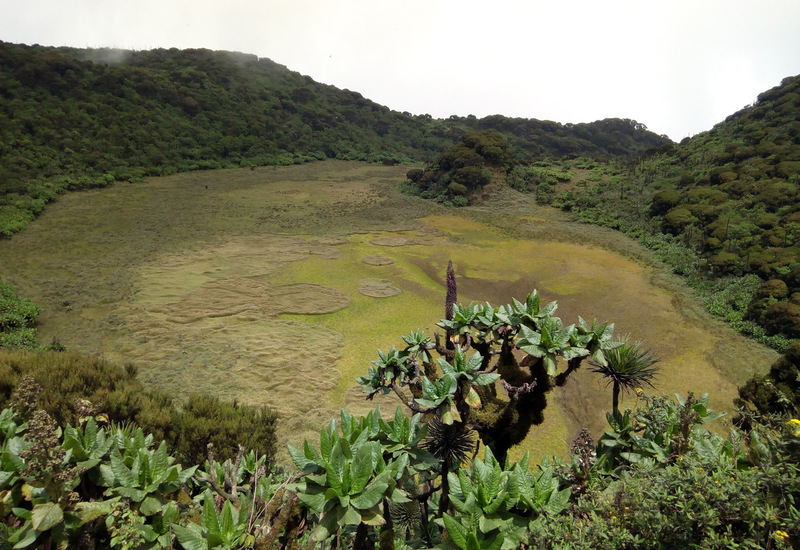 We encountered different types of vegetation with every ascent we made towards the summit of Muhavura. The bamboo trees were my favorite part of the hike. A set of tall, slender trees lined up against each other with hundreds of bird nests resting high up in the branches undisturbed. The trees provided a cool shade that made walking underneath them very mentally & physically relaxing. We occasionally halted at resting points for refreshments and to take memorable pictures. The trek was quite easy in the start as the ground was quite level. However I started to feel a bit nauseous and dizzy as we began ascending towards the peak. I regretted the fact that I had not swallowed my Acetazolamide tablets to help with the altitude sickness. By slowing down and drinking plenty of water each time I felt nauseous, I was able to control it. Pam was way ahead of us and at 62 years of age, I greatly admired her zeal and energy. 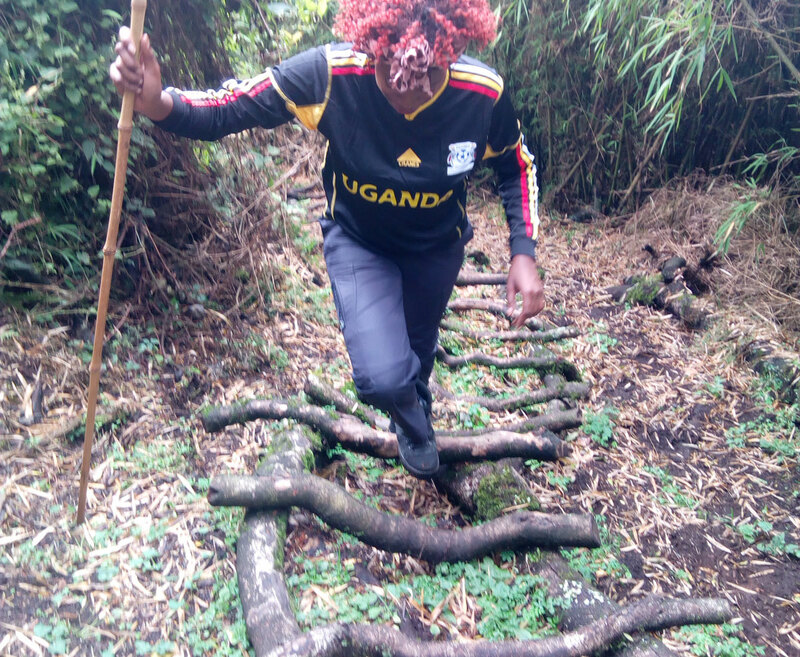 She was as fit as a fiddle and she didn’t seem exhausted as she ascended the mountain like a true warrior until reaching the peak. She greatly inspired me and I am working hard to ensure I am as physically fit as Pam is when I get to her age. 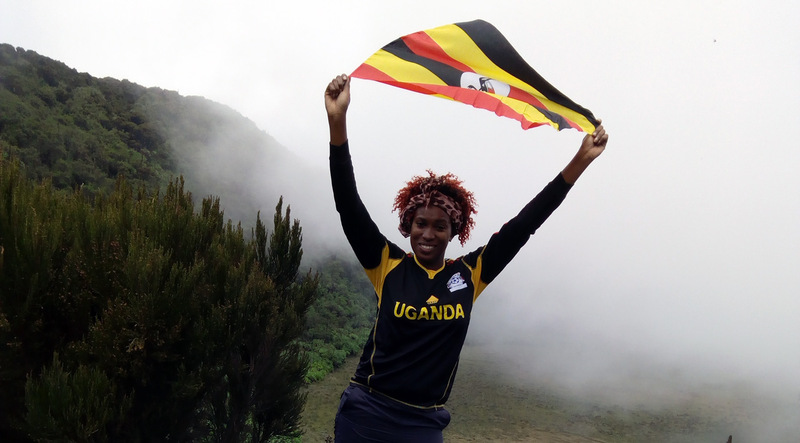 The view at the top was eye-catching and I took off my Ugandan flag and proudly raised it in the air. Pam, Zachariah and I took amazing photos at the top as we waited for the rest of the group to join us. 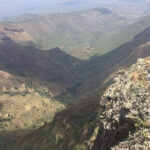 The peak of Gahinga is the central location of all the borders of Rwanda, Congo and Uganda. That explained the various “Welcome to Congo” and “Welcome to Rwanda” texts I received from Tigo and Airtel telecommunication providers on my phone! 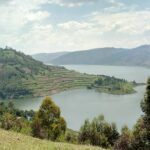 It was a bit confusing as we were in three different countries at the same time – even the time zone had changed as we had adopted the Rwandan time zone that is an hour behind Uganda’s. There was a bit of a downpour as we walked towards the camping site, resulting in a beautiful rainbow arcing across the sky in the distance. Too good a photo opportunity to miss, so we stood and posed for more photographs and walked back to base. It felt good taking off my shoes after an 11-hour hike. I opted for a hot relaxing shower and relaxed with a glass of vodka. 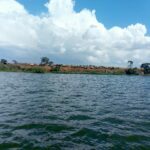 I scrolled through the pictures on my phone and sent them to my friends to intentionally make them jealous and to obviously market the beauty of Uganda.